Eighty-five young musicians appeared before three professional performing artists last weekend during the 12th annual Junior Chamber Music auditions. One by one they played two pieces of music to demonstrate their skill range and to help the adjudicators find a spot for them in the elite music training program. 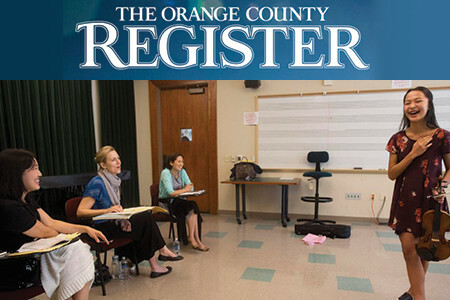 The program, open to Southern California musicians ages 9-20, connects students with a network of world-class musicians and provides opportunities to participate in workshops, tours and concerts. It also emphasizes the importance of teamwork and demonstrates how a collaborative effort can lead to success, said artistic and executive director Susan Boettger. Boettger believes chamber groups are the ideal way for a musician to experience music. “You get this unique opportunity to be a part of a team, but at the same time you’re the only one playing your particular part,” she said. The added responsibility of carrying your own part of the music, Boettger said, brings students a renewed appreciation for and attention to the intricate details of their technique. “The small-group environment motivates (the students) in a way that nothing else does,” said Boettger. After the students audition, Boettger and her team of coaches place them in groups according to level and age. Chamber music artists are divided into groups of three or four, with each student playing a different instrument. Groups can also include vocalists. Once the students are assigned, they meet at least once a week for four months to work on a single piece of music that will be presented at their final concert in March. Throughout the rehearsal process, the groups are visited by professional coaches who offer tips and guidance.